(by William McGurn, NY Post) – What makes a man throw himself on a grenade? In the age of the selfie, it’s a timely question. Because amid the tweets, instagrams and snapchats and the criticisms of a narcissistic youth they engender, a 24-year-old Marine shows another side of this generation. His name is William “Kyle” Carpenter. He’s a corporal who was medically retired for wounds suffered when he used his body to shield a fellow Marine from a Taliban grenade. Some 30 surgeries after he was written off for dead, he will next month become the 15th member of an elite company of men: those who have been awarded the Medal of Honor for their actions in Afghanistan and Iraq. Some of the photos of Cpl. Carpenter are disturbing, especially those showing him without the right eye he lost in the blast. They stand in marked contrast to the self-adoring selfies so often posted on social media. Then again, the scars he bears carry their own terrible beauty, a testament to an ethos that leads a fighting man freely to offer his own life for a brother. For Cpl. Carpenter the moment arrived on an Afghan rooftop in 2010, when his squad came under Taliban attack. At some point, an enemy grenade rolled out. In a blink, Cpl. Carpenter jumped on it to spare his good friend, Lance Cpl. Nicholas Eufrazio. Lance Cpls. 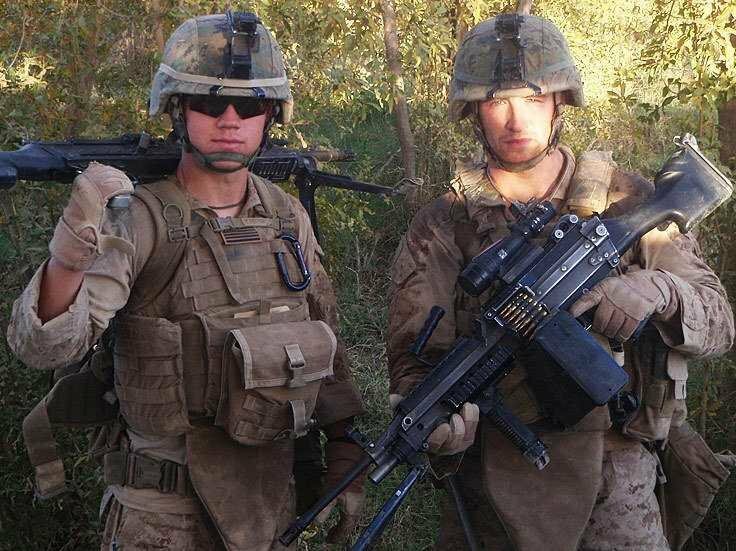 Kyle Carpenter (left) and Nicholas Eufrazio are pictured in Marjah, Afghanistan during their 2010 deployment. Each Marine suffered terribly. Lance Cpl. Eufrazio sustained serious wounds, including injuries to his brain. Cpl. Carpenter lost an eye, most of his jaw was torn off and he spent years in recovery. But he’s since run a marathon, and he asks for no one’s pity. It’s notable that of the two other Marine Medal of Honor recipients from these wars, Jason Dunham was also a corporal who leapt on a grenade to save other Marines. Dunham did not survive. [I was] a White House speechwriter [at that time and] was privileged to draft the remarks for that ceremony. On that bittersweet day, President George W. Bush quoted Cpl. Dunham’s mom, a pretty extraordinary woman herself: “Jason,” she said, “was part guardian angel, part big brother, all Marine.” In short, the boy she raised knew what it meant to be a man — and a leader of other men. The Marines are rightly proud of their Medal of Honor sons. Yet the self-sacrifice they exhibited is by no means unique to the Corps. In these wars, three other men – two Army and one Navy – have also earned the Medal of Honor for taking a grenade to save ­comrades. Army Private First Class Ross McGinnis was a machine gunner in northeast Baghdad when an insurgent threw a fragmentation grenade into his Humvee. He could’ve climbed out and saved himself. Instead, he threw his back on the grenade and absorbed the blast himself, saving four soldiers. Army Staff Sergeant Leroy Petry was an Army Ranger clearing an enemy compound in Afghanistan. When a grenade landed a few feet from two downed and wounded Rangers, Staff Sgt. Petry picked up the grenade only to have it explode as he was throwing it away from his Rangers. He and they lived, but the blast took his right hand with it. Petty Officer Michael Monsoor was a Navy SEAL on a residential rooftop in southern Ramadi when an enemy grenade bounced off his chest. Monsoor was the only one in a position to escape. Instead of running, he yelled “grenade” and jumped on it, smothering it with his body and saving two other SEALS. “There are guys who I was with who didn’t come back, so it’s hard for me to wear this and have the spotlight on me the rest of my life when they lost their life on a hot, dusty field in Afghanistan and most people don’t even know their names,” he said. [On] June 19, Cpl. Carpenter will stand in an East Room of the White House bursting with Marines in full dress uniform. Before his family, friends and comrades in arms, President Obama will drape around his neck the white-starred blue ribbon holding the Medal of Honor. Our nation’s highest award for valor. And the ultimate anti-selfie. Published May 22, 2014 at The New York Post. Reprinted here May 22, 2014 for educational purposes only. 2. 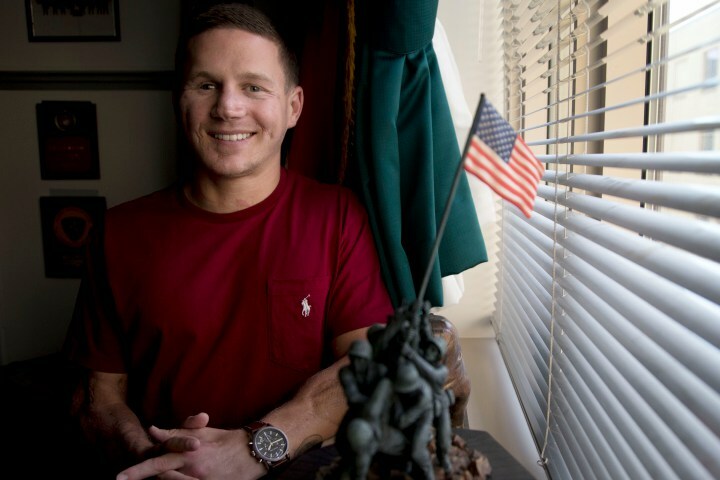 Kyle Carpenter was about 20 years old when he threw himself on a grenade to save his friend. What 2-3 adjectives do you think best describe the type of man he is? Explain your answers. 3. How does Cpl. Carpenter’s story inspire you?